Dublin North West Together for Yes are hosting a public meeting to officially launch our local Together for Yes campaign in Dublin North West. There will be a panel of speakers to answer questions and highlight the importance of a YES vote to the health and well-being of women in Ireland. All are welcome – attendance is free, but registration is required. 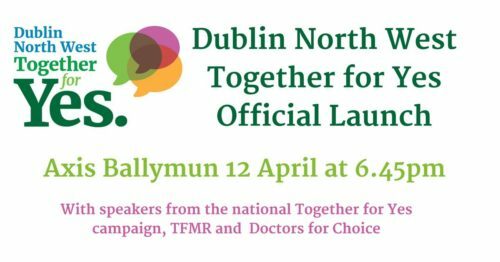 Speakers include Orla O’Connor, Co-Director of the national Together For Yes campaign, Dr Marion Dyer from Doctors4Choice and Amy Walsh from TFMR (Termination For Medical Reasons) and the event will be chaired by Grainne Healy, former Co-Director of the Yes Equality Campaign.